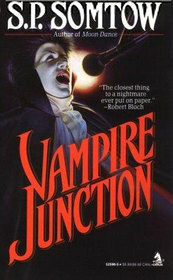 By all appearances, Vampire Junction looks to be just another addition in a tirelessly long line of mediocre paperback fare that was spewed forth by both talented and hack writers alike during the 1980s. It's hard to go into a tale detailing the trials and tribulations of immortality with a straight face when the cover to the book shows the powdered face of a young boy (looking somewhat similar to Justin Bieber) singing his undead heart out while wearing a velvet cape and baring his fangs. But somehow author S. P. Somtow manages to downplay the ridiculous notion of a vampiric teeny-bopper singer and delve into some fertile ground that explores the deeper psychological themes surrounding the vampire myth. Timmy Valentine has stolen the hearts of millions with his soaring, lyrical voice. But his own heart does not beat at all, for Timmy is a vampire that has existed for thousands of years. Although on the outside Timmy is an angelically beautiful boy of twelve, inside he is a tormented soul who only wishes to solve the mystery of his existence. In order to do this he enlists the aid of psychiatrist Carl Rubens to journey into the night realm that is his mind in order to retrieve the elusive answer to his cosmic dilemma. But it won't be easy going. There are people who are after Timmy, all for their own reasons. From the insidious and diabolical Gods of Chaos cult to Stephen Miles, Carla's pyromaniac ex-husband, they are all determined to seek the boy vampire out. Everyone will converge upon a small town in the north for a final confrontation ending in death, terror, and new beginnings. Even by the year of 1984 when Vampire Junction was finally published after years of rejection, the vampire legend was as dried and desiccated as one of the monster's own victims. From the massive flooding of the undead tales that surged during the Gothic literary movement to the countless film depictions of debonair aristocrats stealing away robed virgins, the vampire had just about been impaled by its last and final stake. Anne Rice's re-introduction of the sympathetic and cursed bloodsucker in her novel Interview with the Vampire aroused the public's awareness that these creatures could also be as emotionally damaged and psychologically complex as any other human.1 But whereas Rice only touched upon the dark psyche of the vampire, Somtow charges into the territory full speed ahead. There are a few moments where he slips and begins to enjoy the sound of his own psycho-babble a little too much, but for the majority of the novel Somtow keeps the strange workings of the vampire mind fresh and intriguing. Somtow explores the depths of Timmy's mind through the use of modern psychology. One of the more fascinating points to arise from this approach is that Timmy does not exist as an actual flesh-and-blood creature. 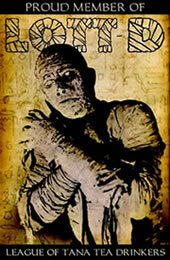 He is not a physical being but more of a living archetype, a shadow that lives in the darkness of the human race. He is a conceptualized idea, a miasma of all the fears and loves of our collected subconscious. In some ways, Somtow mentions in the book, Timmy is a reflection of us, the smoky essence we see peering back at us from the glass. This is used to explain why Timmy, and therefore all vampires, does not cast a reflection himself. He is a dream-thing, lacking in true shape and substance. These socio-psychological ties are also brought up again for other long-held beliefs of vampires. Timmy no longer fears the sight of holy talismans. He explains that since society has become more and more detached from their superstitious grip on religion, it has rendered their relics impotent. With no faith to instill in the physical object, the weapon becomes ineffective against Timmy's thousand-year-old wisdom. It is only newly-turned vampires that still react badly to the presence of crucifixes and garlic. In the presence of films and other pop culture mediums that perpetuate these legends, the new vampires are subconsciously fearful of these weapons. That is, until they finally learn how to master their dark powers and turn humans defenseless. Although there are supporting characters who have their own secrets and cracks in their grey matter, Timmy is always the focal point of the novel. His mystery is the one that draws us in and keeps us captivated. Somtow peels away the layers of Timmy's past by showing us his bizarre and epic journey before and after transformation. These journeys into history bring us face-to-face with such horrors as the concentration camps of Nazi Germany and the dreaded castle of Gilles De Rais, the defiler and mutilator of children notoriously known as "Bluebeard." Somtow even explores Timmy's more contemporary adventures, all of them further developing the boy vampire as a sympathetic hero, despite some of his bloody habits. Somtow drenches his entire novel in extreme and passionate emotions, whether it's in the grand decadence of the Gods of Chaos or the strange love that develops between Carla and Timmy. It can feel like a whipping rollercoaster of tones and moods at times, but with a weird bit of magic Somtow makes it work. Cap it all off with some gratuitous gore that drenches the chapters in splatterpunk debauchery, and you have a rip roaring book that dips into the best of both horror worlds. So grab your tickets, kiddies. The train's due to leave the Borgo Pass any minute now. 1 Credit should also be given to Suzy McKee Charnas, whose novel The Vampire Tapestry, published four years prior to Somtow's book, also dealt with the mind of a psychologically intricate bloodsucker. Submitted by Will E. (not verified) on Fri, 2010-11-19 12:37. Submitted by Somtow (not verified) on Mon, 2010-11-22 21:22. Submitted by Jose Cruz on Tue, 2010-11-23 07:13.